A nunnery is supposed to have stood here until it was dissolved during the Reformation. According to legend, the mother superior was beheaded for opposing the dissol­ution and her severed head was mounted on a pikestaff and displayed on the green. There’s almost zero evidence for any of this – even that the nunnery ever existed – although the Shoreditch nunnery of St John the Baptist did own land here in the late 12th century. 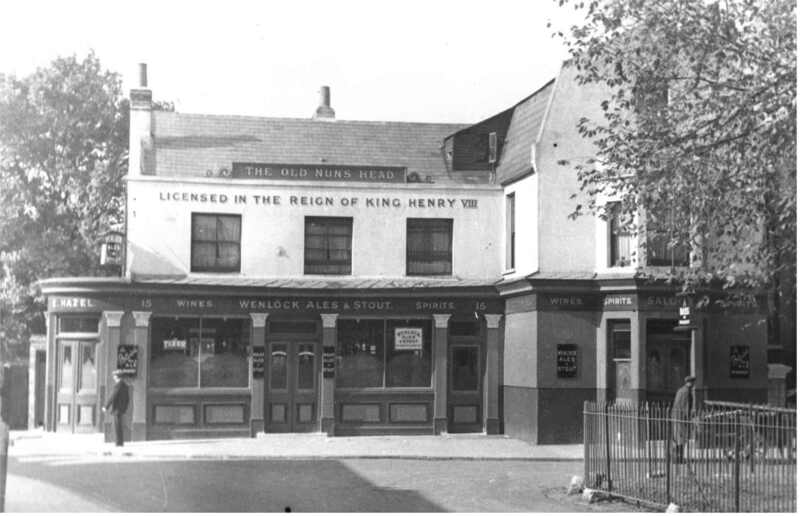 Nevertheless, there has been a Nun’s Head inn on the green for hundreds of years and, however it got its name, it could have been the origin of the locality’s identity. The place was first mentioned in writing in 1583, when Edgar Scot sold Thomas and William Patching certain estates ‘lying at Nunn-Head’. It was first spelt as ‘Nunhead’ in 1680. Nunhead was a market gardening hamlet when 58 acres were taken for All Saints’ cemetery in the late 1830s. The main entrance lodge was built on Linden Grove, where Charles Dickens later set up an apartment for his mistress. The cemetery is now an attractive wilderness, although parts have recently been restored. The Girdlers’ Company and the Metropolitan Beer and Wine Trade Society built almshouses west and north of Nunhead Green in the 1830s and 1850s, respect­ively. Both have survived in good condition and the original terrace of seven Girdlers’ almshouses (Beeston’s Gift, 1834) is shown in the photo below. Single-storey ranges have been added to the north and south, consol­id­ating all the company’s homes at this site since 1980. In the north of the district, St Mary Magdalene church was consec­rated by the Bishop of Winchester in 1841. It was destroyed by a bomb in 1940, rebuilt in 1962 and rebuilt again in 2010–11. In 1854 the Southwark and Vauxhall Water Company acquired a 14-acre site west of the cemetery and built two reser­voirs, which are now capable of deliv­ering 43 million gallons a day. 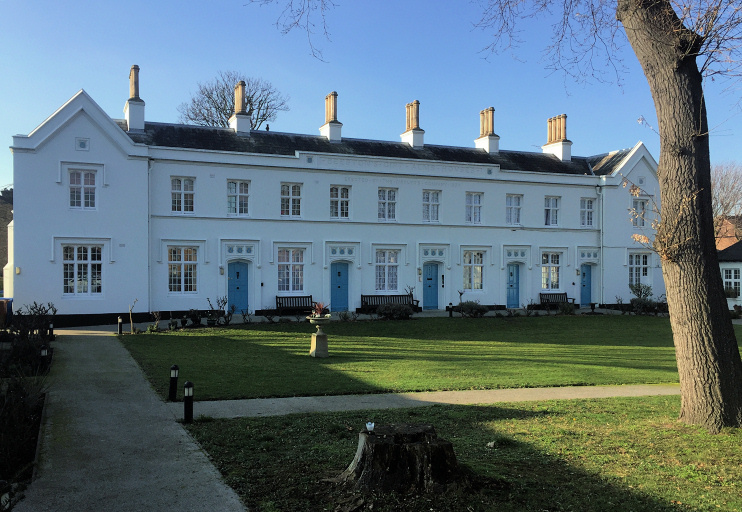 The vestry of Camberwell acquired Nunhead Green (originally Nun Green) from the lord of the manor in 1868 on the under­standing that it would remain open to the public in perpetuity. Brock’s fireworks manufactory operated at Nunhead in the 1860s and 70s as “sole pyrotechnist to the Crystal Palace Company” and contracted to make two million cartridge tubes for the French army during the Franco-Prussian war. Contrary to the pub’s claim on Facebook, the Pyrotechnist’s Arms isn’t built on the site of the fireworks factory, which was actually in the middle of a field, near what is now the junction of Barset and Howbury Roads. Nunhead Junction station (as it was originally called) opened in 1871 and St Antholin’s church was built on Nunhead Lane in 1878. The district was built up in the 1870s and 1880s by a variety of specu­lative builders, mostly in a fairly haphazard fashion except for the more carefully planned Waverley Park estate (see the page on Newlands). This was the work of one of south London’s pre-eminent specu­lative builders, Edward Yates, but it was not a great success; 310 of its 742 houses stood empty in 1907. Nunhead library was built at 88 Gordon Road with money donated by the philan­thropist John Passmore Edwards, who laid the found­ation stone in April 1896. The Arts and Crafts style building is shown in the photo below right. St Thomas the Apostle RC church opened in 1905 at 81 Evelina Road. The unpre­pos­sessing building is of the ‘Ellis box’ type – one of around two dozen such struc­tures erected in the early years of the 20th century, mostly in the Archdiocese of Southwark. It was funded by Frances Ellis, an heiress and convert to Catholicism. Other surviving Ellis boxes have been beautified consid­erably more than this one. Members of the Gandolfi family made photo­graphic equipment at two addresses in Nunhead from 1913 to 1981. The company’s hand-made wooden cameras are said to be to the world of photo­graphy what Stradivarius violins are to music. The station was rebuilt on the opposite side of Gibbon Road from its prede­cessor when the line was electrified in 1925. 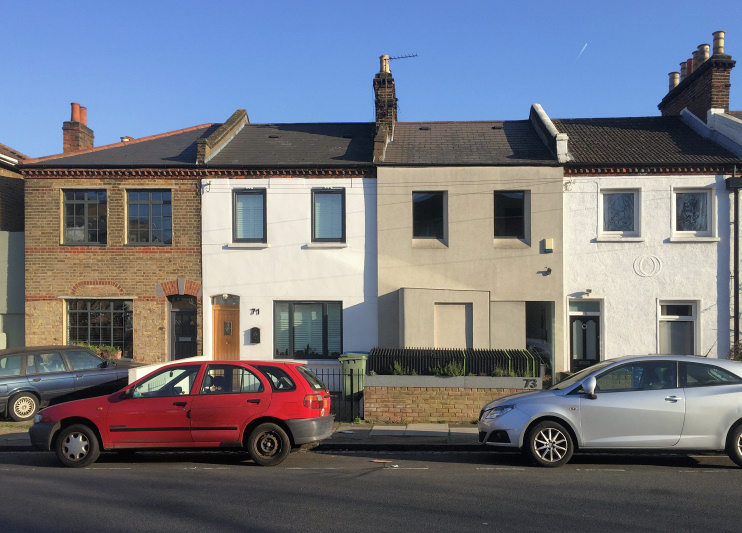 Before and after the Second World War, the London County Council built numerous blocks of flats in the area, notably on the Nunhead estate in the 1950s, although many terraces of Victorian houses remain – most of them a little grander than the group in the photo below, on Gordon Road. St Antholin’s church was restored after it had been gutted by firebombs during the Blitz and was renamed St Antony in 1958. In 1990 the parish was combined with that of St Silas. St Antony’s was declared redundant in 2001 and sold for about £1 million to a Pentecostal congreg­ation. Also in the 1950s a new Salvation Army hall replaced the church’s 19th-century ‘citadel’, which had been destroyed in the war. Nunhead Green conser­vation area was desig­nated in 2007 and includes the green itself, the buildings surrounding it, and some of the streets leading away from it, including parts of Gordon and Consort Roads to the north and Nunhead Grove and Linden Grove to the south. The Nunhead Tavern was closed for several years in the early 2000s and “came back from the dead” as the Old Nun’s Head in 2007. In 2014 the street artists Pure Evil, Inkie and APHQ created their versions of Carlo Dolci’s St Catherine of Siena (1665) for the pub’s exterior, as part of the Dulwich Outdoor Gallery project. 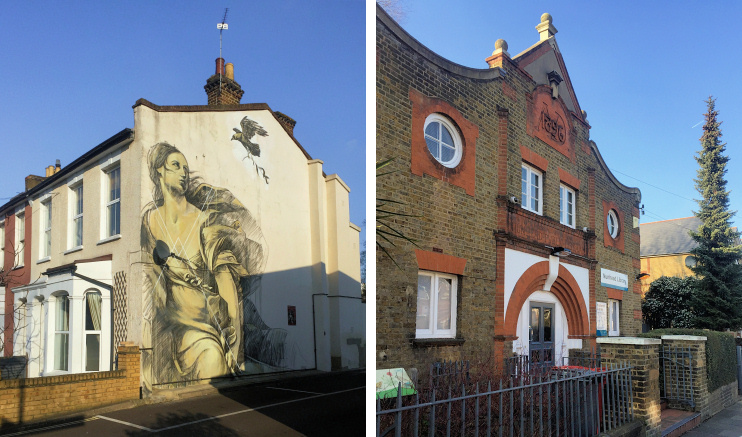 The project’s other piece in Nunhead is Faith47’s inter­pret­ation of Guido Reni’s Europa and the Bull (c.1640) on a house at the corner of Consort Road and Monteagle Way, shown next to the library photo above. 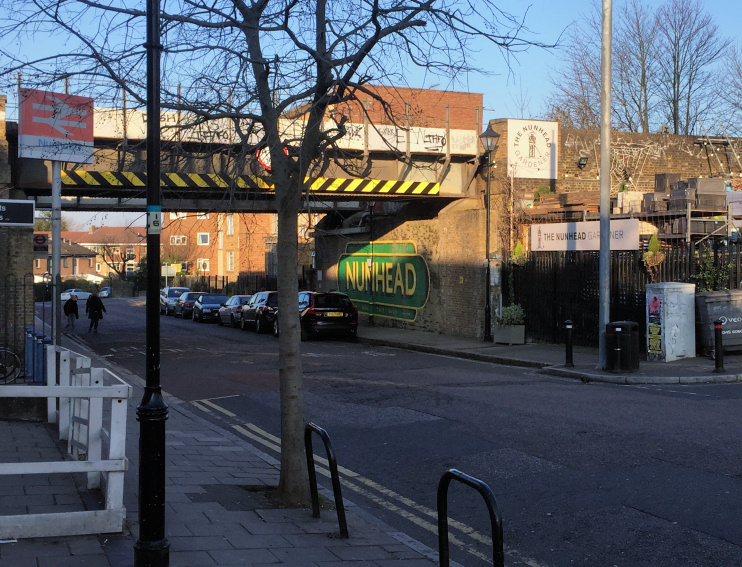 In 2016–18 two 1970s council buildings on the west side of Nunhead Green were replaced by the Green community centre and a devel­opment of flats and houses called Nunhead Green. According to the 2011 census the largest ethnic group in Nunhead is white British, followed by residents of black African and black Caribbean origin or descent. Sixty-one per cent of residents were born in the United Kingdom and the next most common countries of birth were Nigeria and Jamaica. The ward’s population is split almost equally between those living in flats and those occupying a whole house. The most common field of employment is human health and social work activ­ities. The murderous Victorian burglar Charles Peace lived in a suburban villa on East Terrace, Evelina Road. The photographs on this page are by Chris Barrett and are used here with his kind permission.